Cassy of Knit The Hell Out came out with a pattern recently that made me find a small-ish child to put a garment on just so I could make it. Her Ruffaluffagus tunic/dress calls for sock yarn, of which I had plenty from making gloves. Or I thought I did. I ended up getting two more skeins because I think I really only had about a single skein to begin with. 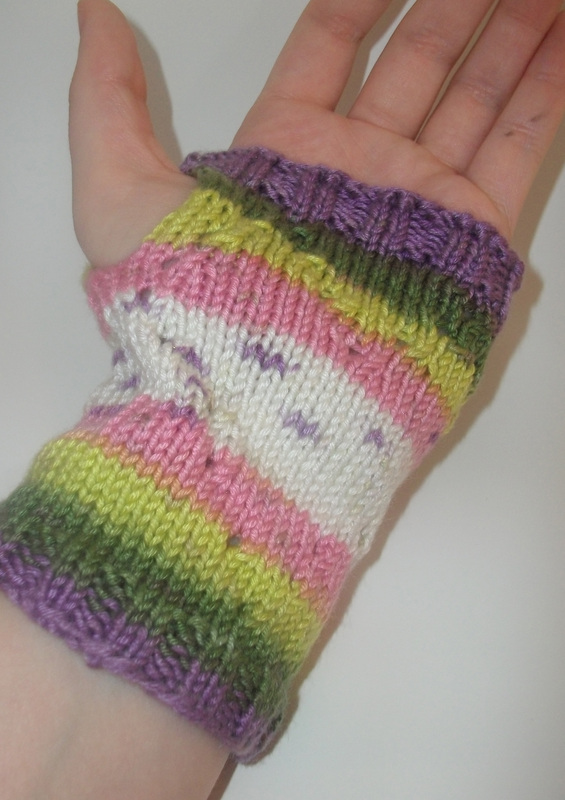 The yarn I used was self-striping and the stripes really worked well with the gauge. 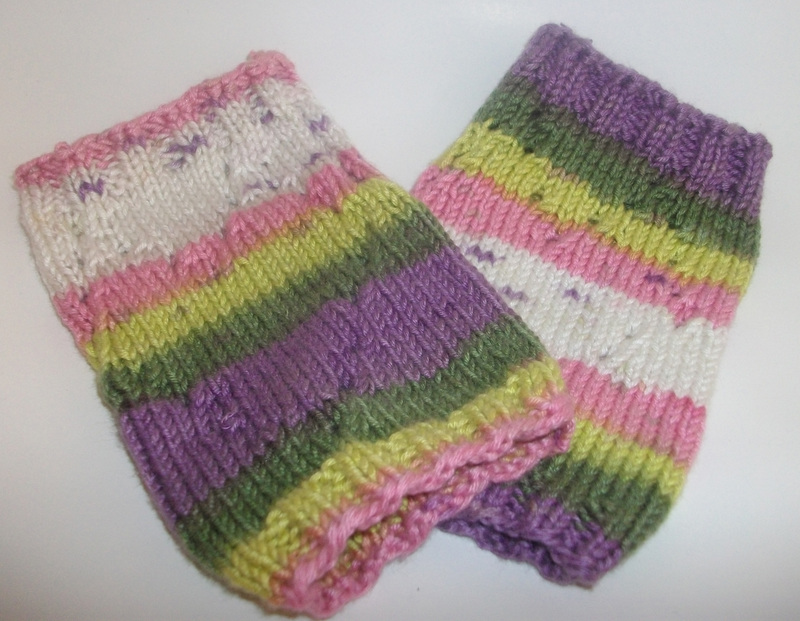 For more complete information about the yarn I used, visit my Rosettaluffagus project page. The pinks in the yarn inspired the name, and also the accompanying headband. Since the dress was for a little girl who loves hair accessories, I made a matching headband. (Project info here.) I am going to write up the pattern here soon, just to give myself a little practice writing patterns. I knit the band, then crocheted the flower separately and sewed it on with the center button. The dress pattern was great. It was very easy to follow, which was good considering I had not knit (or even sewn, for that matter) an actual garment in a long time. The only thing I had any sort of complaint about was weaving in the ends, but that was my own darn fault. I had to buy two extra skeins of the yarn, obviously in a different dye lot than the first skein, so I not only had to stripe in the new skein to blend it, but keep up with the color changes to make the stripes correct. Lesson learned, next time make sure to have enough of the same dye lot to make the whole thing. One of my favorite parts is how the short row sleeves make the stripe pattern mostly match up from the armhole to the sleeve. I didn’t even have to try to get that part correct. This is four days, three balls of yarn, fifteen repeats, and twenty-five inches long. Slightly over halfway. I’ve really got to get going to get this done and blocked by four o’clock Saturday. My mom asked me to make her some gloves. About six months ago, when it first got cold. So i started out to make some from my own pattern. The catch was, there had to be fun fur on the main part of the hand, and nowhere else. Two failed attempts later, the fur was moved to the cuffs. I then tried the Ramona Flowers Fingerless Gloves which seemed like they would be pretty awesome. They are worked from the fingers down. But joining the fingers was where it went wrong. I was using doubled sock yarn instead of the worsted, and the hand was just huge and floppy. I might try these again from actual worsted weight, but a little down the road. Finally, I found the perfect pattern to make the Fuzzy Gloves. 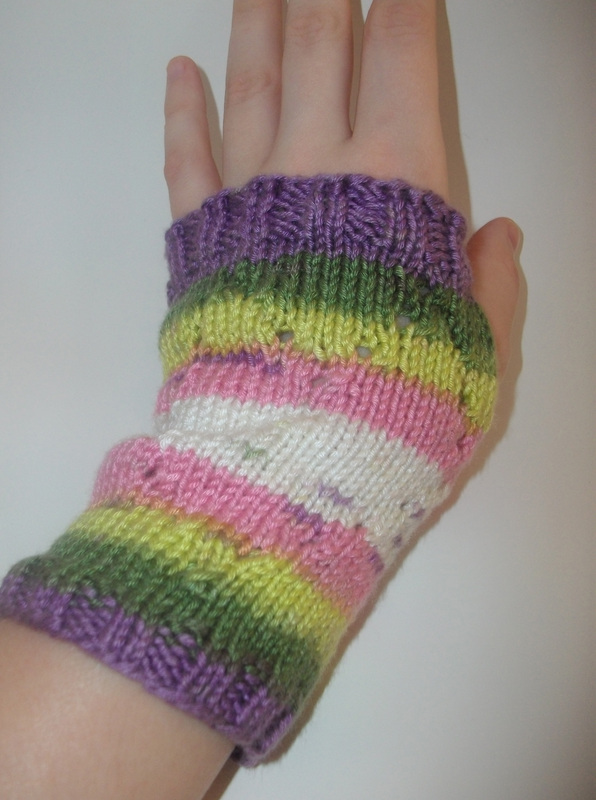 I used the Gerlinde Fingerless Gloves pattern by Isa Web. I love the honeycomb cable on the top. I worked in the ends as I went, so the only weaving my mom had to do was at the ends of the fingers. That’s the deal, she has to weave in the ends when I make her something. Works for me, because I hate weaving ends. 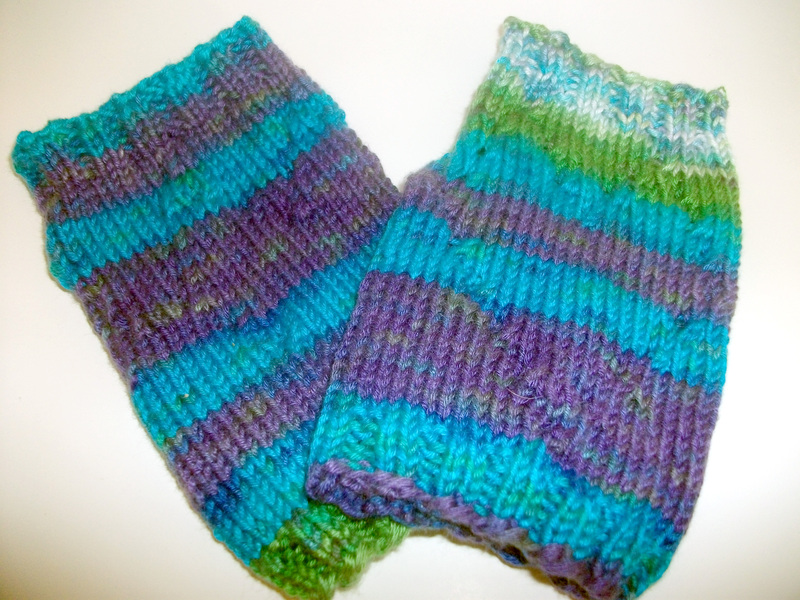 These were made with Premier Yarns Serenity Sock Weight in the surf colorway and Lion Brand Fun Fur Prints in the “207” colorway.